Toenail fungus is a stubborn health condition that causes malformation and discoloration of toenails. In addition, toenail fungus may increase the occurrence of athlete's foot or infection to the nail bed. Home remedies can be as effective as pharmaceutical treatments. Both require regular applications. Without aggressive treatment, toenail fungus will continue to thrive. Consult with your doctor to rule out possible health problems that can cause susceptibility to toenail fungus such as tuberculosis, diabetes or immune problems. Toenail fungus not only looks unappealing but also is highly contagious. Like any fungus, toenail fungus thrives in damp areas. The first step in countering this stubborn fungal infection is to keep the toes exposed to fresh, dry air as often as possible. However, because of the unappealing appearance of toes infected with fungus, this can be a challenge for infected individuals. 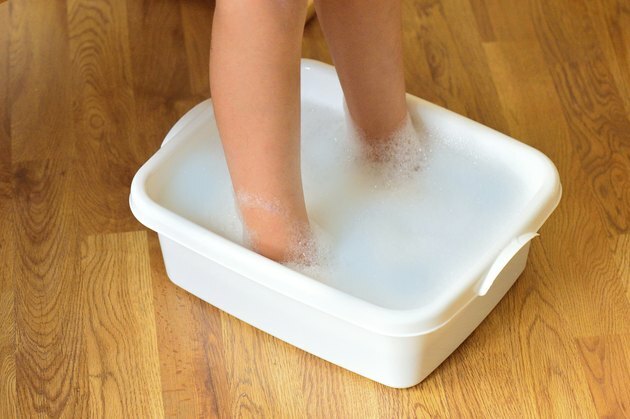 Apply a daily mist of anti-fungal essential oil to any common area, such as bathtubs, showers and barefoot areas to prevent contamination from one person to another. As tempting as it might be to hide fungal discoloration with nail polish, this technique can seal in fungus, making it impossible to treat properly. Delay nail decoration until all signs of fungal infection have disappeared. Any fungal infection in the nail bed of the foot will require six months to a year to eradicate with aggressive treatment. Whether you choose pharmaceutical treatment or home remedies, getting rid of foot fungus in the nail bed is not for the faint of heart. Forgetting to apply treatment for days at a time will increase the time frame for healing. Home treatments may be effective in eliminating stubborn foot fungus, according to author Matthew Wood. Soaking the feet twice a day in a hot solution of baking soda and citric acid creates an inhospitable environment that penetrates thick collagen fibers of the nail. Citric acid has the additional function of being anti-fungal and may lighten darkened toenails for improved appearance. Naturopathic doctor Robert Ullman recommends treating fungus-infested toenails with an additional application of pure tea tree essential oil after each citric acid and baking soda wash. Highly anti-fungal tea tree essential oil is found in many over-the-counter preparations designated for foot fungus. Keep all essential oils away from pets and children to prevent accidental ingestion.